Rock formations rise majestically from the waters of Lake Mohonk and the natural surroundings remain virtually untouched since the day Quaker twins Albert and Alfred Smiley came to visit in 1869. They envisioned a peaceful retreat for the soul—a place to enjoy the beauty of nature and to renew body, mind and spirit in a unique setting. Since that day, guests including Andrew Carnegie, Theodore Roosevelt, former First Lady Julia Grant and John D. Rockefeller have been making their way to Upstate New York and onto the 26,000 acres of state park lands, private preserves and the resort property know as Mohonk Mountain House. Starting with just a 10-room inn, today the fourth generation of the Smiley family oversees operations of a property that boasts 267 guest rooms, many with balconies and fireplaces, featuring Victorian, Edwardian and Craftsman décor. 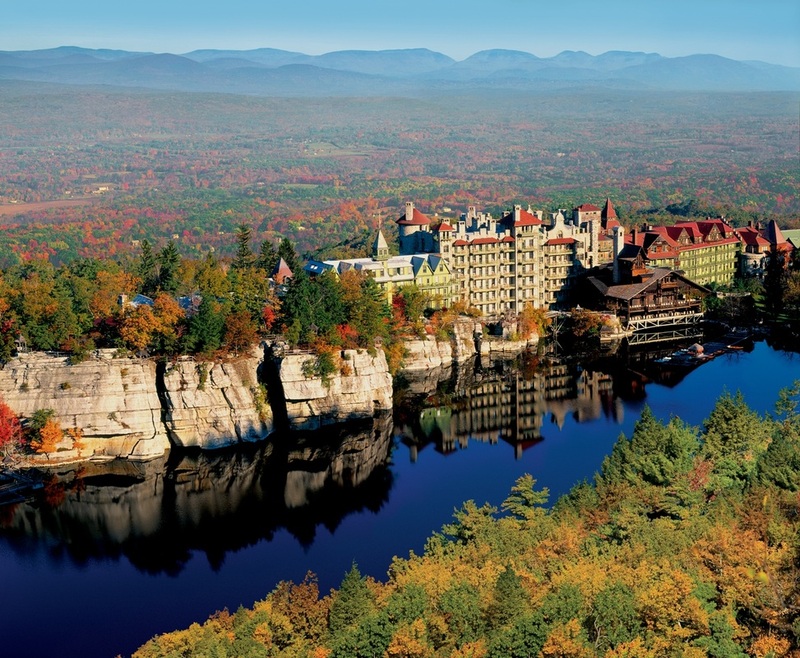 A member of Historic Hotels of America since 1991, Mohonk received an award from the United Nations Environment Programme recognizing 125 years of environmental stewardship and was designated as a National Historic Landmark in 1986. Located just beyond the southern border of the Catskill Mountains and the western side of the Hudson River, the Victorian character of this absolutely stunning property has been impeccably preserved. Boasting beautifully carved woodwork, period furnishings and cozy wood-burning fireplaces in many guest rooms and parlors, this is a place to unwind and truly become one with nature. With 85 miles of hiking trails and carriage roads, which are dotted with romantic gazebos and resting spots to take in the gorgeous views, this is an order that is easy to fill. If being out on the nature trails does not appeal to you, relax your mind and body amidst the 30,000 square-foot spa wing which includes 16 treatment rooms, a solarium and verandas for lounging, steam rooms and saunas, a stone fireplace and an outdoor heated mineral pool. Unwind with one of their signature treatments like the Texting Tension Tamer: A Massage for Multi-Taskers, which targets the neck and shoulders where soreness results from hours of working online. This is just one of many ways to relax and appreciate this extraordinary destination. Other recreational opportunities include hitting the links on their 114-year-old 9-hole, par 35 Scottish-influenced golf course, rock climbing, boating, fishing, swimming, horseback riding, tennis and much more—not to mention the wide array of winter fun. All of these activities assure the development of a significant appetite and you will be delighted to find that dining at Mohonk includes a vast array of wholesome foods prepared with the freshest local ingredients. Guests enjoy meals prepared by award-winning chefs, whose efforts have won numerous medals in national culinary competitions. Those who are not simply on a day pass have the convenience of their American Plan, including three meals daily (buffet style), afternoon tea and cookies, which during the warm months can be enjoyed in one of the hundred or so rocking chairs on the deck overlooking the lake, as well as traditional formal dining options for dinner. The Smiley family has taken their role as owner and custodian of this exquisite piece of land seriously. They have conveyed portions of their property into the Preserve and have received awards for the stewardship of their land and their early environmental awareness. Mohonk Mountain House is rife with fascinating history, an experience to be treasured by the whole family and a truly beautiful place to unwind and set your soul free.